Most people are quite familiar with the common flashlight. There probably isn’t a household or toolbox in America that doesn’t have a flashlight or three of some type present. 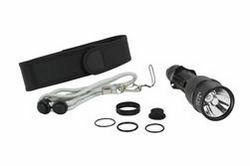 Most typical flashlight owners however do not view flashlights as important tools that can be as specialized as any set of wrenches. In reality, flashlights are indispensable tools that are often tailor made to fulfill specific roles critical to the completion of highly critical tasks. While we may think of specialized flashlights as either higher powered than normal flashlights, or designed to project intense spotlight beams for applications like military or law enforcement use, the specialized nature of many flashlights goes far beyond such simplistic assumptions. One of the best examples of a flashlight designed to specific duties requiring illumination with unique qualities is the ultraviolet flashlight. Yes, an ultraviolet flashlight is one that produces light very much like that produced by the black lights many of us used to have hanging in our rooms as teenagers. UV flashlights, however, serve much more important and specialized applications and are indispensible tools employed by professionals in many fields. UV flashlights serve in a variety of industries including agricultural, law enforcement, military, industrial manufacturing, biotechnical services and many many more. UV flashlights are useful because of the way they can cause certain materials to fluoresce and how the difference in the intensity of this fluorescence indicates differences in the materials being illuminated. Different materials can produce different colors, and differences in textures and surface details can affect fluorescence as well. Details that would otherwise normally be invisible or very hard to detect can be revealed under the illumination of a UV light. A mechanic for example might add a fluorescent dye to the coolant in an automobiles’ air conditioning system; he can then illuminate the system with a UV flashlight and easily detect where leaks are occurring. Machinists can use UV light to illuminate the surfaces of newly formed parts, which in turn can help to reveal hairline cracks or imperfections in the items surfaces. The list of applications where applying UV light provides an effective means of non destructive testing and inspection are long and varied. Some of the more specialized areas of UV light use are found within the aerospace, manufacturing, medical and law enforcement fields. The critical nature of these applications and the difficulty often encountered with vision based inspection procedures makes the ability of UV light to more clearly reveal fine details crucial. Traditionally, most of these fields relied on bulky and less than practical UV light sources that were often difficult to apply to small projects. Additionally, the high heat produced by these systems and the tendency for the UV light sources to shift through the UV light band as the lamps aged made them more difficult to employ. The units had to be handled carefully, the heat could potentially damage sensitive materials, and the mercury vapor bulbs and UV filters employed had to be regularly tested to ensure they were emitting light over the proper part of the UV spectrum. UV flashlights help to solve many of the problems encountered in traditional UV testing applications because of their small size and relatively more reliable operation. The small size of UV flashlights makes them ideal for applications in industries such as the aerospace and law enforcement sectors as workers can easily illuminate surfaces by hand without having to manage a large piece of equipment. This is important when workers must inspect items such as wing surfaces or land gear assemblies where it is difficult to get the light onto the desired area because of the items location or inaccessibility. Rather than lug a large piece of equipment with the accompanying cords up a ladder and attempting to illuminate the seams in a wing for instance, a worker can simply use the handheld UV flashlight. For law enforcement, officers can very easily illuminate surfaces with UV light in order to reveal bloodstains or potential DNA evidence without having to maneuver unwieldy lighting equipment around a crime scene. UV flashlights can be used in many other applications as well. Professionals in the antiques industry for example can use them to inspect paintings and antique documents for signs of forgery or alterations. Many paintings created before the introduction of modern paper, canvasses and pigments used earlier versions of these materials which had little or no fluorescent properties. This means that these earlier materials will “glow” very little when illuminated with UV light. By illuminating a suspected forgery with UV light, inspectors can reveal if someone has used modern materials which will fluoresce, thus revealing that the item in question is either fake or altered. United States currency can also be effectively inspected with UV light. Paper money is often marked with fluorescence sensitive identifiers which will be revealed when illuminated with UV light. This reveals to the inspector whether or not the notes in question are indeed genuine or counterfeit. Industrial manufacturing benefits from UV inspection by using fluorescent dyes and marking agents which can be applied to the surface of materials to reveal imperfections and defects. When the worker applies these marking agents to a surface, they impregnate any porous areas or cracks that normally would be invisible to the naked eye. The worker applies these markers, gently wipes the surface clean of excess, and then illuminates the surface with UV light. Any remaining marking material that has become embedded in a crack or fracture will then fluoresce, this revealing the defect. There are a whole host of applications that have benefitted from the introduction of portable UV light sources such as ultraviolet flashlights. Their small size, relatively inexpensive cost, high versatility and easy maintenance makes them much better suited to the fast pace and critical nature of many applications compared to the expensive, bulky and difficult to maintain UV light sources they now replace. For operators who require the ability to perform non destructive testing and inspection procedures quickly and effectively, UV flashlights offer an ideal solution.